Whew! That’s all I can say about this summer. It has been a crazy whirlwind of more crazy….with a side of crazy. 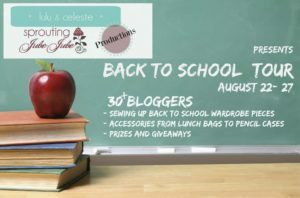 I’m excited about taking part in the Back to School blog tour with Lulu & Celeste and Sprouting Jube Jube. However, instead of focusing on kids’ clothes or accessories, I decided to take this post in a different direction. We’re homeschoolers, but my big kids are taking part in a Waldorf co-op three days a week this year. The twins will also be in preschool three days a week. I’m not entirely sure how smoothly this transition will go. I struggled between choosing two or three days because to be totally frank, having 5 kids at home is far easier than shuttling them to two different schools, packing lunches, making sure they have everything they need, etc etc etc. BUT–in the end I went with three FOR ME. There, I said it. Yes, I could just put my kids in public school, but that’s not what we want for our family, so it’s not the right choice for me. My son started asking to take tennis lessons last winter. I was really surprised because he was only five at the time and none of us really played tennis. He kept asking for a few months, so we finally signed him up last spring. He loves it, and I love his coaches. We recently moved to a new neighborhood with a really active tennis league. My husband and I have been talking about joining. 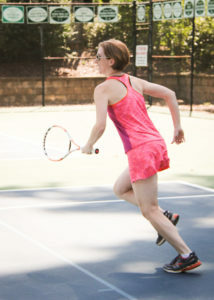 He is a pretty good tennis player, but I’ve never really played that much! I took lessons when I was a kid, but I remember them as being more of a social hour for me. ha! So, I’ve decided to start taking tennis lessons on one of the days the kids are in school this fall. I’m SO excited. I’m partly excited because I’m doing something athletic, but I’m also excited about meeting other moms. (Hmmm…sounds like I’m still treating it as a social hour! hahaha) I’m also looking forward to playing tennis with my son. 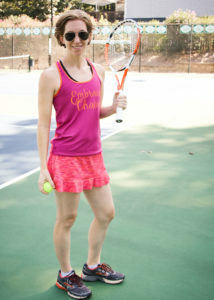 I opted for the shortest length in the Shenanigans Skort with a flounce and a tennis ball pocket. I also chose to make a matching Resolution Bra and Tank. Then I used my brand new heat press to put vinyl on my tank! I’ve wanted a heat press for a while and man, I’m in love with it. I will now vinyl all the things! ha! Next up, I’ll be making the longest length for my less-active daily life. 🙂 I love that I can run, lift, play, and go to church in all the different options of this skort. I can even make a swim skort out of it! I’m glad I focused on me for this blog post. My kids are spending their days playing outside, building fairy houses, and wading in the creek; so they didn’t need new clothes anyway. 😉 Make sure you look at the other blogs taking part in the tour and enter to win the great prizes! Come join our 5oo4 Facebook group and you’ll be able to see tons of inspiration and get any questions answered. And don’t forget that 5 out of 4 is having a 20% off sale in the shop with the code BTS2016 during the tour through 8/31. Here are all of the sponsors for the prizes. There are daily prizes (see the Rafflecopter below!) as well as a sew along prize and a grand prize. 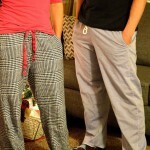 Check out the round-up post at Sprouting Jube Jube to read more about the prizes and how to enter. There is a ‘grand prize’. The giveaway opens on Monday Aug 22 and ends on Sunday Aug 28. Prize details in the post linked above. Check out all of these sales during the blog tours! Designs by Call Ajaire: Get 20% off in their Etsy shop with code BTS2016. Code valid from August 22nd through August 27th. 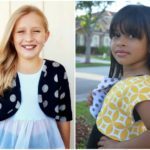 E+M Patterns: Save 50% with the code backtoschool on their website or in their Etsy shop. Code valid until August 27th at 11:59pm PST. 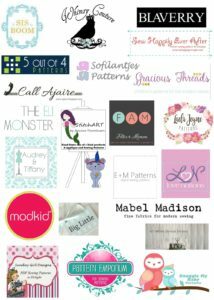 MODKID: Get 25% off your entire purchase in their Etsy shop with code BTS2016. Code valid from August 22nd through August 27th. Love Notions: Get 20% off all kids patterns with the code loveschool. Code valid from August 22nd through August 27th. Sew Happily Ever After: Get the Nana’s totes pattern at 50% off with the code BACK2SCHOOL2016. Code good through August 31st. 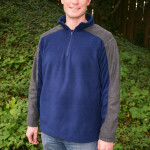 Laela Jeyne Patterns: 30% off Any Single Pattern, No Code needed. From August 25-29th, 2016. StitchART: 20% off with the code back2school in their Etsy shop. Valid from Aug 22nd – 28th, 2016. The Eli Monster: Save 20% with the code yayforfall. Code valid until August 29th, 2016. Filles à Maman: Get 25% off with the code BTS2016. Can be used on their website or in their Etsy shop. Code valid from August 24th through August 28th midnight EDT. Whimsy Couture: Get 50% off, no code needed! End August 31st, 2016. 5 Out of 4 Patterns: Save 20% with code BTS2016. Valid from August 22nd-28th midnight EDT. Cannot be used on fabric. Snuggle My Baby Patterns: Save 25% with code BTS2016. Valid until August 31st, 2016. Don’t forget to enter for today’s drawing! Runs from August 24 12:00 am EDT until August 25th at 11:59pm EDT. The last two entry links on the blog are not working correctly. They should be fixed now! Thanks for the head’s up. I can completely relate! We have 4 kiddos and each work full time. In trying to make sure everyone’s needs are met, my needs are often no where in sight. But, that’s how it goes I guess. Love the new skort pattern! Can’t wait to try it out! I am lucky enough to work 4 days a week (32 hours) so I try to sneak me time (sewing) during nap on my day off. It will be much easier once school is in session since my oldest will be gone. Just love the skirt and am looking forward to seeing it in the longer view(for us older and not in good shape) ladies! Ooooh I love me a good skort! Love the skorts but I think I would have to make mine longer as I am a lot older than you. I love your post. Your comments about five kids, and your decision process for this year rings true for me, since I have four kids, and we home school too 🙂 I love the skirt too! Beautiful, will not have the choice to add this pattern to my collection ou 5 out of 4 patterns! Great job on the skirt! Awesome that you got to focus on yourself and sew something for you! I look forward to doing that, once I finish the projects for my girls. Definitely need to get this pattern!! ? This pattern is an absolute staple… I will forever keep it at the top of my go to list. Thanks for the amazing pattern ladies! I love the skirt. I love that you chose to sew something for yourself. Thank you so much for being on the tour!